Mom made soft-boiled egg on buttered toast for us all during our childhood. Periodically since Mom died, almost 10 years ago, my sister Nicole makes it, but I never tried it. Today my wife Abby and I needed a light meal for lunch, since we plan to have our usual pizza party for dinner as we watch the Super Bowl*, so I decided to give it a try. I called Nicole and she ran down the process: put eggs in cold water, bring to a boil, remove from heat and let sit for three minutes, rinse in cold water, peel and spread over buttered toast. Its flavor did not leave us wanting, and Max the Chihuahua even got a little chunk I dropped on the kitchen floor. 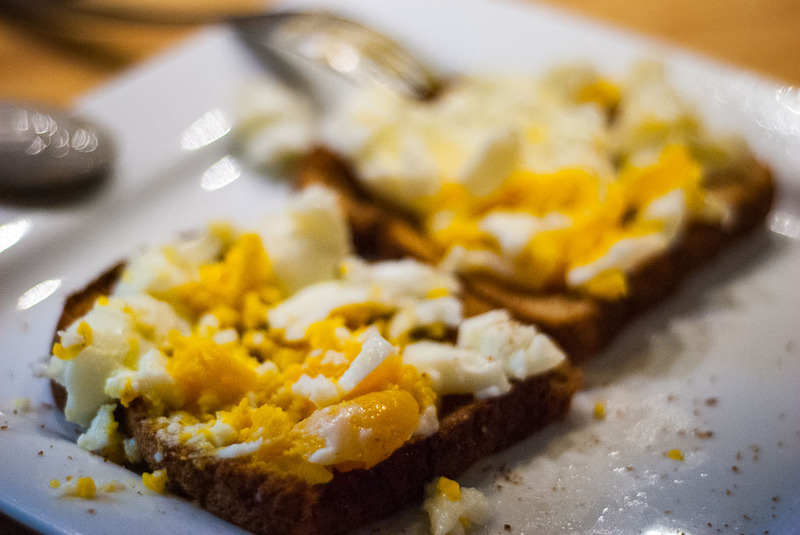 Soft-boiled egg on toast is delicious, and for Nicole and me, brings back something great from our childhoods. *I read recently that the Super Bowl is second only to Thanksgiving in terms of one-day food consumption. I eat soft boiled eggs on toast often. It’s one of my favorite meals for breakfast lunch or supper.